These bite-sized lime green fruits are a real treat to snack wuth huge crops of beautifully sweet, tasty, bite-sized fruits that ripen early and continue throughout the summer. This is the next generation on from the ‘Sungold’ family. 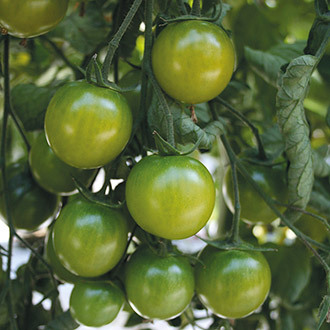 High yields and uniform fruits with good disease resistance and early to mature. This cordon variety is best grown in the greenhouse, but will also grow in a sherltered, sunny spot outdoors. Last Order Date: Despatch: From 30th April 2019. GROWING INSTRUCTIONS: Sow: indoors March to April for outdoors crops or January to March for growing in a greenhouse, 0.5cm (quarter-inch) deep in pots or trays of seed compost. Keep moist and maintain a temperature of approx. 15-20oC (60-68oF). Transplant to individual pots when plants are large enough to handle and reduce temperature to approx. 15oC (60oF). Harden off late April and plant out to large pots, growing bags or the greenhouse border when plants are approx. 15cm(6in) tall. Support plants and pinch out side shoots as they appear. Water daily and when first trusses have set apply a liquid fertilizer every two weeks. Harvest: June to October, outdoor crops from August, harvest as the shoulders start to colour.